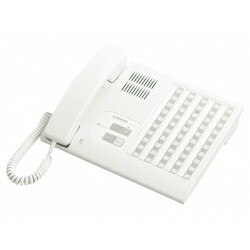 The NHX Series is a UL 1069 Listed nurse call intercom. The system provides staff alert and communications for a variety of health care applications: nursing homes, assisted-living facilities, clinics, wards, and hospitals. AIPHONE NHX-80XThe NHX-80X is the control center of the Nurse Call system providing microprocessor c..
AIPHONE NHX-50MThe NHX-50M master station is able to receive two levels of calls and communication w..
AIPHONE NHX-30GThe NHX-30G 30 station add on selector expands the NHX system to its maximum capacity..
NHR-30K 30-Call Add-On PC Board for 51-80 Stations FEATURESProvides additional capacity for NHX..
NH-1SA/A Single Call Patient Station FEATURESBedside sub station for calling and communicationS..
NH-2SA/ADual call patient station for NHX system.AIPHONE Authorized Master Dealer Jakart..
NHR-SPThe NHR-SP duty station provides tone and LED annunciation for any calls placed from a patient..
NHR-3A-4The NHR-3A-4 4 zone indicator lamp provides light annunciation at the junction of hallways o..
NHR-4A/AThe NHR-4A/A Dual Bulb Corridor Lamp provides light annunciation outside of a patient room w..
NHR-7AThe NHR-7A Bathroom/Urgent call station provides call annunciation from a bathroom associated ..
NHR-8CThe NHR-8C bedside call cord provides call annunciation from a patient station when the button..
NHR-DPADummy call cord plug for NH-1SA/A and NH-2SA/A patient stations.AIPHONE Authorized Mast..